We think that our Universe is a gravitational field that expands and contract periodically. It is entangled to (intersected with) at least another universe. For us the known as “Big Bang” is the consequence of the simultaneous contraction of two entangled universes (or the contraction of one of them and the expansion of the other one). It occurs periodically and its waves are analogue to a light photon (or to the pushing forces created by an electron or a positron). Each contraction is followed by an expansion. It is accepted that the current expansion accelerates. In this sense we consider that when contraction takes place, it exists a period of time when the gravitational fields do not have movement until the expansion starts again. This period of “non time” produces a progressive delay that causes a progressive inversion of the phase of variation (that produces what is currently known, we think, as the perihelion precession) of the gravitational fields (in this case universes). 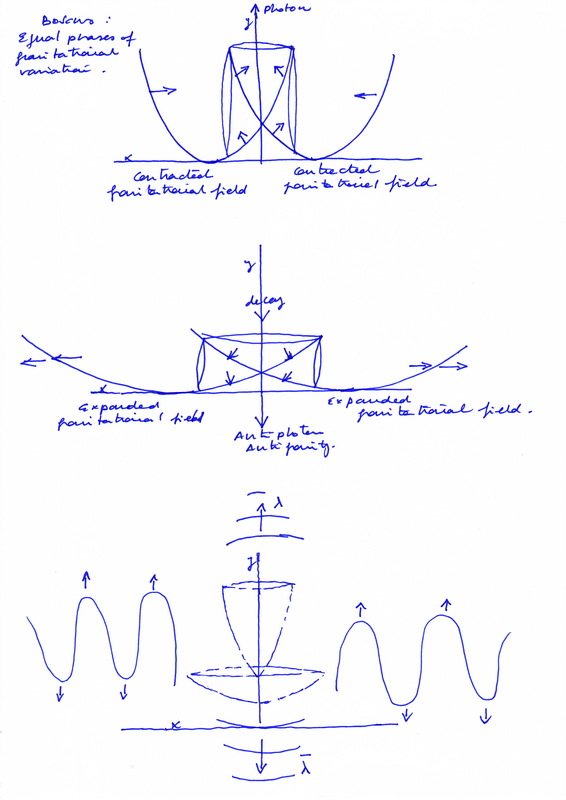 I have drawn some pictures (they are the same that we are drawing in this blog for explaining nature at atomic level) that show what we consider gravitational waves are. 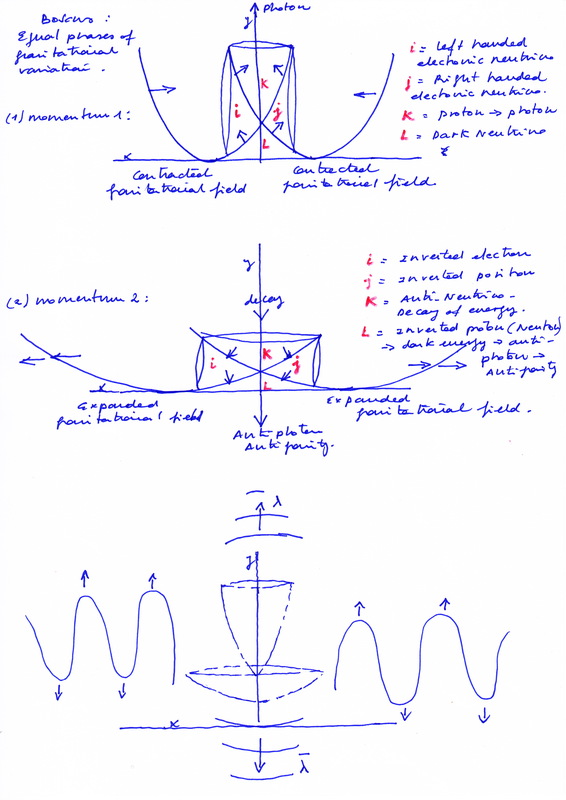 The picture above represents two entangled gravitational fields that vary with oposite phases. 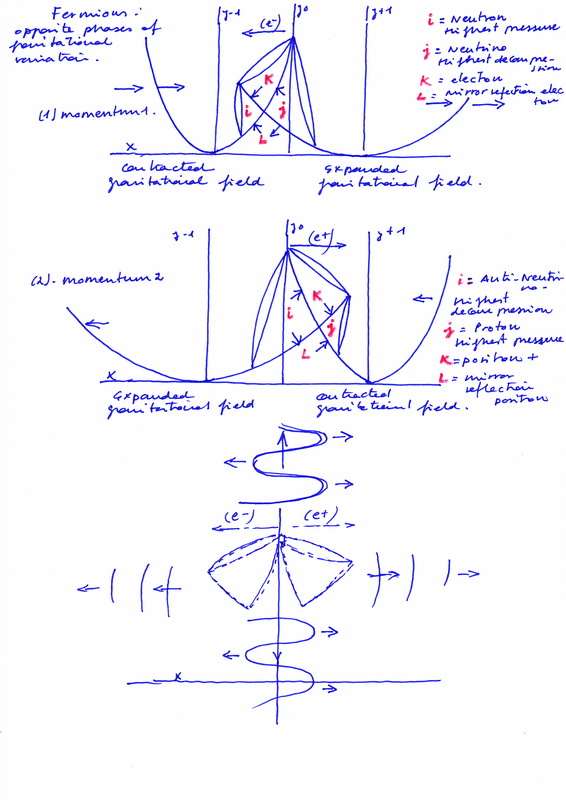 The last figure shows the waves that the gravitational mechanism produces. The picture above represents two entangled gravitational fields that vary with the same phase. We do not need “inflation” (or its lack) to explain the symmetries (and asymmetries) of this fields. We need only a periodical variation and an intersection between at least two fields that vary periodically. 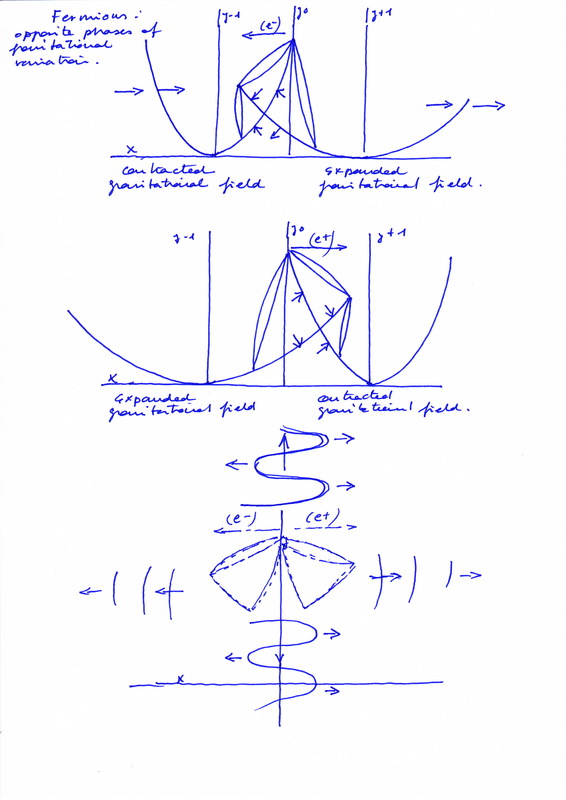 The intersection between the left and right gravitational fields create 4 new fields or dimensions. Are these other fields electromagnetic? We think that the distinction between electromagnetism and gravity is artificial and it depends on the measure that we get as the reference to determine what is gravitational. Each one of these left and right gravitational fields would depend on at least two other bigger intersected fields and son on in an infinite way. under this perspective the difference between gravity and electromagnetism is relative and results of a convention. The picture above represents bosons (when the entangled gravitational fields vary with the same phase). The picture below represents Fermions (when the entangled gravitational fields vary with opposite phases). But if we use this pictures to explain our solar solar system it appears a lot of discrepancies between this model and the current accepted Solar system model. We think that the current unchallenged solar system model is a very insufficient description of reality and it needs to be reviewed in a deep way. Mainstream physics works with the same ptolemaic geocentric model of planets orbiting around a center with the unique difference that now is considered that in the middle is the sun and not the earth and that planetary orbits are elipses and not circles. The current model is very simple – as Copernicus wanted – because all the old epicycles have been eliminated. But this model does not offer a unique mechanism that explain all solar system asymmetries and periodical fluctuations that need ad hoc hypothetical explanations (as the offered for Venus’ retrograde movements) and it is not adequate to explain nature at atomic level. 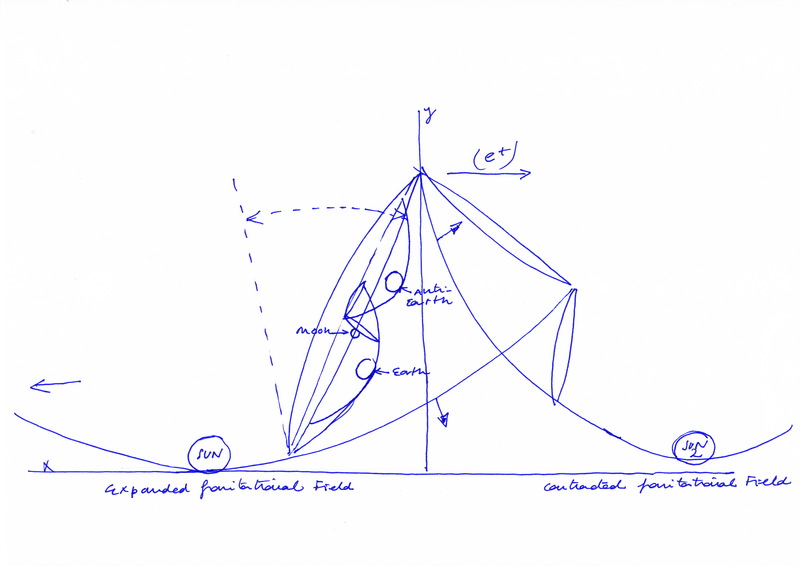 Copernicus would have rejected this model too because it is totally asymmetric. Unexplained asymmetries was the main cause that moved Copernicus to reviewed the old solar system model. You can see in other posts what we think about a different solar system model that includes antimatter as mirror and mirror reflection matter. We guess that planets does not orbit around the sun, and that an anti-earth has its gravitational field entangled with our Earth’s gravitational field. If our Sun is in the middle of our planetary system, we think that it is because our Sun has its gravitational field entangled with the gravitational fields of other four stars, a gravitational intersection by each spatial direction. And known (and unknown) Solar System’s planets would orbit inside of the fields created by those intersections, at least two planets inside each field, but not around our Sun, inside of those fields there would be not any star… and those fields would act as different dimensions. I know that this estelar model produces so many rejection, much more than our atomic explanation, because people consider that in the XXI century, with all our technology, satellites, spatial telescopes and vehicles landed in different planets, it would be totally imposible that our current solar system model were so wrong as we are suggesting here. We have no problem with critics, all are well received. And we are aware that a big change of paradigms, always provoque big oppositions. 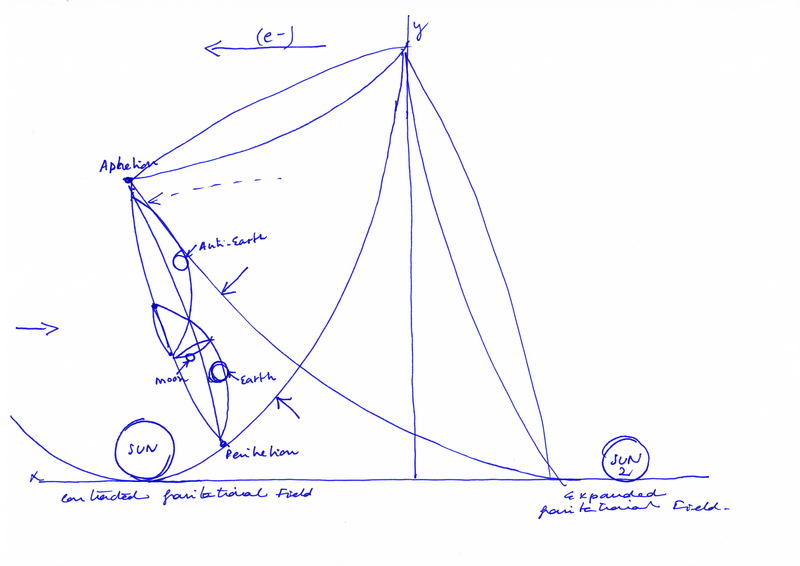 Do not forget that the old ptolemaic model served to predict eclipses too. It was reviewed because it was considered as conceptually inconsistent.